WYGRF- Season Winners (American Version). Who you gonna root for? Who's it gonna be? Is it Heather, Duncan, or (will you pick) Owen?. Wallpaper and background images in the Total Drama Island club. This Total Drama Island fan art might contain street, city scene, urban setting, anime, comic book, manga, and cartoon. 1. 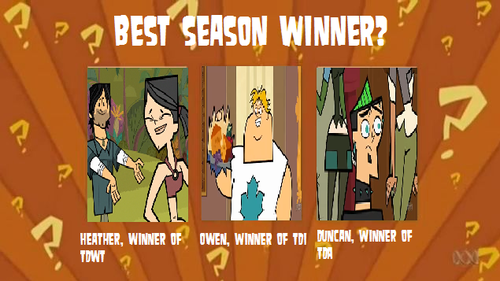 Owen won TDI because of Izzy and Lindsay. 2. 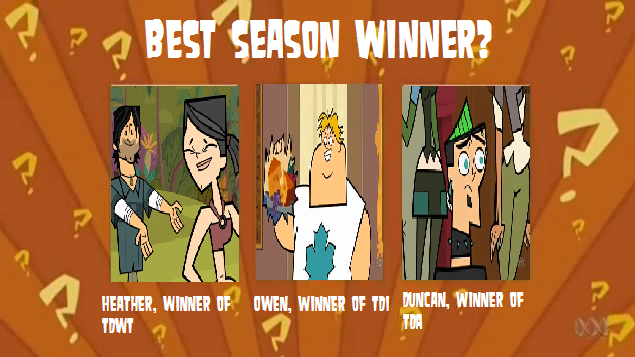 Duncan, who was tied with Beth in Episode 25, won TDA in a tiebreaker vote from the TDA ex-contestants. I would choose Duncan if I still liked him, but I pick Owen now; I always hated Heather, and since Duncan cheated on Courtney, the thought of him makes me sick. Owen of course! Everyone is forgetting that Duncan is a jerk who picks on the best characters all the time, and cheated on Courtney, which really downplayed Gwen's good nature. Everyone is ALSO forgetting that Heather is a tool, and backstabs everyone, and another thing, Heather didn't even win! The winners are Owen, Duncan, Alejandro, & Cameron. Owen or Duncan. They have been my all-time favorites!!! Although in s3 I wish Cody would have won becuase the other 2 were backstabbers and evil.